There are new reports that new Honda City facelift will be launched by the end of the year 2016. The popular Honda City is consistently posting good sales in its segment and Honda now wants to keep the model updated with changes in features and design tweaks. The existing Honda City models which are being sold was launched during the beginning of 2014 that is when it managed to outsell the sales numbers of Hyundai Verna. What distinguishes new Honda City facelift from the old is presence of new front grille which is inspired from its previous model. The rendering put up by IAB makes it look very similar to the previous model. Things that are similar are 3 horizontal thin chrome slates and headlamps. Most of the changes which you see in the new Honda City facelift are cosmetic. There is going to be new set of alloy wheels and the rear will be getting a minor tweak in its tail lamp styling. There is going to be new front as well as rear bumpers in the Honda City facelift. The redesigned bumpers of the Honda City facelift looks pretty appealing and matches the design of the City facelift front grille. Very recently, Honda released the facelift of Amaze which made it look stylish too. As the car industry knows, the Honda City is the best selling vehicle in its segment and the company wants to retain this spot. The sooner the Honda City gets an update, the better will be for Honda. 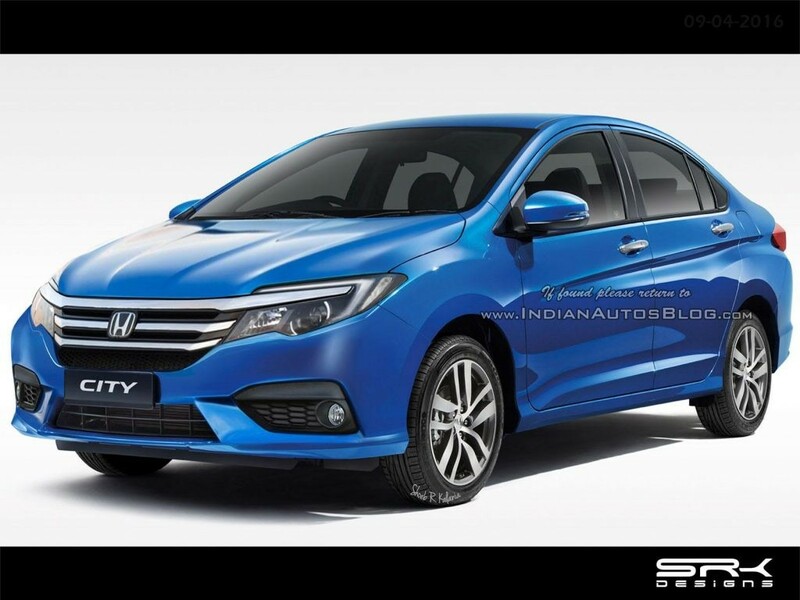 The New Honda City facelift would ride on 175/65R15 tyres and there is going to be new design for the alloy wheels. When we talk about the interiors of the car, the new Honda City facelift gets a revised interiors. City facelift will retain the glossy black centre console which comes with a new larger touchscreen infotainment system that comes with features like maps, AVN, reverse parking camera with assist, bluetooth connectivity for telephone and audio, start and stop, keyless entry and also the sunroof. When it comes to safety, the new Honda City facelift would be getting have dual airbags and ABS ( Ant-lock Braking System) as a standard feature. 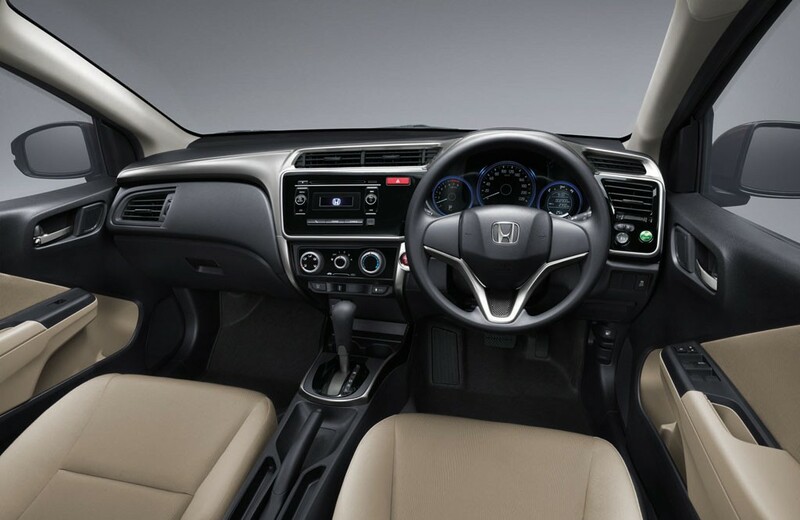 Except the new music system with MirrorLink, the Honda City facelift’s inside will be same on features. The new City facelift would be getting leather seats on the higher variants and the car will be getting a four charging point. Honda is trying to make sure that Honda City model will be the most feature loaded sedan in its segment. Honda City’s front row space is good and at the same time, even the rear seat knee room is good. Rear seat passengers can experience fixed headrest. Talking about the engine of new facelift, the Honda City facelift would be getting a 1.5-litre petrol engine that is capable of churning out 115bhp of power and 145Nm of torque. The upcoming Honda City’s engine will be mated to a six-speed manual transmission that makes this car a lot more fuel-efficient and also enhances the performance. The City will even have a CVT (continuously variable transmission). Honda City facelift’s diesel model will be powered by 1.5-litre 4-cylinder engine that produces 98bhp of power and 200Nm of peak torque. Even the diesel engine gets a six-speed manual transmission gearbox. The new Honda City facelift would not be getting any major upgrades when it comes to to the engine. So, What is going to be the mileage of new Honda City Facelift? The mileage of Honda City facelift mileage is going to be more than that of its predecessor. While the petrol variant of City offers a fuel efficiency of 13kmpl in city conditions, while on highways the milage is going to be about 16kmpl. Honda City’s diesel version’s fuel efficiency will be 17kmpl in the city and 20kmpl on the highways. The on-road price of Honda City facelift will be in the range of INR 8 lakhs to INR 14 lakhs.